Yesterday the weather-man said that we’d have a frosty misty morning – and we did. He also said that the mist would clear and that we’d have some bright sunshine later in the day – and we did. Jojo and I were out walking in that bright sunshine. We’d been here and there (dreaming of a better life and what it might look like) and now we were walking along the avenue of beautiful lime trees on the southern edge of the park. We’d passed three tubby ladies and their dog. The dog was an average kind of dog – the kind you’d find anywhere. He was called ‘Horace’. Then we’d seen Horace completely lose his rag and bark furiously at a squirrel high up in one of the lime trees. The squirrel had the brass neck (from Horace’s point of view) to chatter back at him. Then the squirrel dropped some husks of nuts down onto Horace and Horace went completely berserk. The tubby ladies shouted out: ‘For goodness sake, stop that Horace – it gets you nowhere.’ They had to backtrack and drag Horace off home. We moved on and then, up ahead of us, we saw an old lady. She was as light and slender as a pixie and she had real style. Maybe it was all about her shoes: they were red and had creamy white souls. Or maybe it was her cream-coloured leather gloves, gloves that matched the souls of her shoes. Or maybe it was her hair – an angel’s kiss in the bright sunlight. When she saw Jojo she stopped and cried out in delight. They knew each other. And so began a conversation. It wasn’t the usual kind of conversation: it all took place in French. For this was ‘Madame Ladbury.’ And Madame Ladbury – an old English woman – was a real bijou of a person. She might not have spoken French for ages but she was determined to find her words and assemble her sentences. Madame Ladbury first told us where she was now living. Then she talked about the precarious state of her offspring; she told us how she was soon to be a great grandmother. She reflected on her most recent visit to Paris – and as she searched for her words she would hold her head in a gorgeous gesture of cultured despair. And when Jojo asked her about how one of her daughters was faring – she looked imploringly to the heavens – and said (in French) ‘Oh, it’s dreadful.’* We didn’t get any more details. But we didn’t need them because whatever Madame Ladbury said was like a sparkle of diamonds on black velvet. When it was time to go, Madame Ladbury held my hand. I could feel the softness of her leather gloves and the strangely seductive press of her tiny fingers through the leather. She held my hand for ages. I didn’t want her to let go. But she did. And as we walked I home thought about that special charm of the old-style gracefully eccentric English. 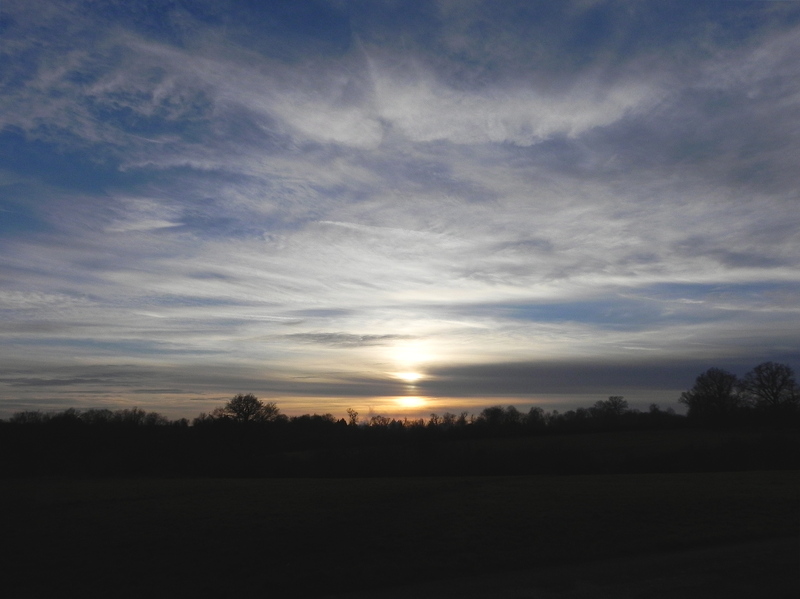 There is a very special kind of evening sky you may get to see in Farnham. To find it you have to make your way to the upper reaches of the great old park on the northern edge of the town; and there, in the late afternoon, on a clear day in January, if you look to the east, the sky will be lilac-mauve before shading into a cool soft grey on the horizon. But if you look west, the sky will be a crisp steel-blue before turning to a clear creamy yellow as it touches the earth. The sky to the east is sober and quietly romantic. The sky to the west glows as sharp as a computer screen. It’s a wonderful sky. I was walking through the park under that same January sky when I passed a group of ramblers; lots of them had grey hair. They were studying the maps of the park and I could see that they were busy identifying some of the park’s history – the locations in which interesting things used to happen. I continued walking. When I looked back the men were still talking. They were still talking about the civil war and the battles. Then, at the end of my walk I came to a small building; it was near to the cricket pitch and it was called the ‘Park office and information centre’. Outside the office was a display telling me about the history of the park (dating back to 1376). There were maps and notes about the flora and fauna of the park as well as references to the fact that a skirmish had indeed taken place during the civil war. There was a display case inside the park office that had, within it, a few skulls, a few animal skulls – but, as far as I could see, no skulls of the civil war soldiers were on view. My walk in the park under the January sky reminded me of how much the English love their history. But why exactly? What is the allure of history? And, more specifically, what is the allure of English history? I suppose that part of the answer lies in the fact that history is a kind of story-telling and as the historians’ stories are told they evoke, in the reader, earlier worlds of heroes and villains, romance and wonder. Meanwhile, the diverse and often terrible facts of reality are submerged. I walked on – thinking about the civil war soldiers – thinking about their fear and discomfort – thinking about their stories, stories that never got to be told. Footnote: The photograph does not show the different colours of an evening January sky. 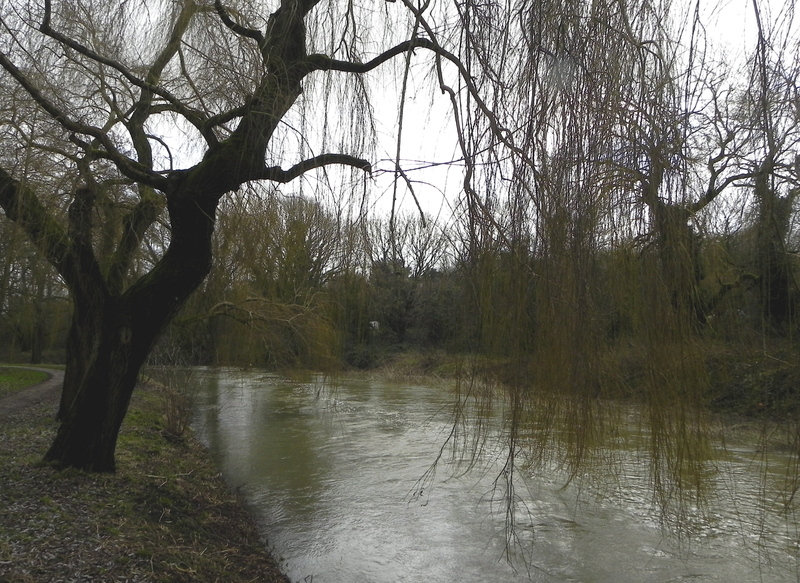 Instead, taken in January 2014, it shows a part of the uniformly leaden grey sky above the river Wey – the river that flows through the town of Farnham in Surrey.